Presbyterian minister; legislator; author of textbooks. Served many churches in Virginia & North Carolina. Home & school 1/4 mile West. 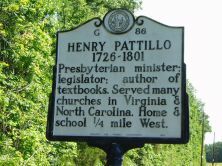 Henry Pattillo, an influential pioneer Presbyterian minister and educator, was born in Scotland in 1726 and immigrated to Virginia about 1740. While working as a schoolteacher, Pattillo yearned to join the ministry. In 1750 he began his studies with Presbyterian educator Samuel Davies, while still working as a teacher to support his family. Through personal illness, marriage, and his mentor’s journey to England, Pattillo continued his studies and earned the equivalent of a college education in 1758. He was then licensed and ordained in the Presbyterian Church. In 1765 Pattillo accepted a call from three Orange County, North Carolina, congregations and moved to the state that would be his home for the remainder of his life. With education close to his heart, he established a small school in his home, filling the need for such a facility in the frontier community. Pattillo’s residence in Orange County put him among the Regulators, some of whom were likely members of his congregations. Although he and the other Presbyterian ministers in the state supported the goals of the Regulators, they did not agree with their methods. Pattillo and the others, including David Caldwell, wrote two letters to Governor William Tryon and to the churches in their presbytery condemning the unlawful acts. Pattillo, Caldwell, Hugh McAden , Joseph Alexander, Hezekiah Balch, and James Creswell founded the Presbyterian Synod of the Carolinas in 1788, firmly establishing the denomination in the region. After nine years in Orange County, Pattillo moved in 1774 to Bute County where he again operated a school and became interested in political matters. He was elected to represent Bute County in the Third Provincial Congress, which met in 1775 at Hillsborough. He was selected to serve as chaplain of the group. 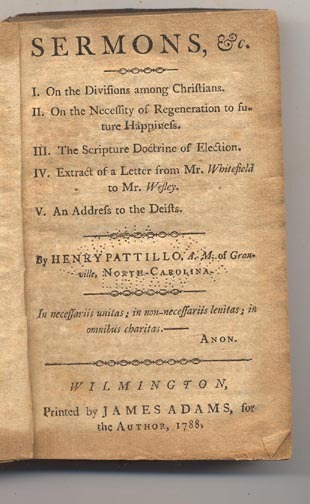 In 1780, by which time he was living in Granville County, Patillo wrote to Charles Pettigrew, “I am extremely frail, and I judge this frame incapable of reparation, until sown a natural & raised a spiritual body.” Out of concern for his well-being, and that of his family, Pattillo’s parishioners in 1784 gave him a 300-acre farm on the condition that he remain permanently as their pastor. During his time in Granville County, Pattillo published a book of his sermons and A Geographical Catechism, a geography text written in question-and-answer format. 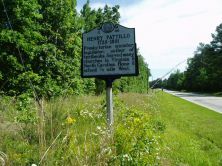 Henry Pattillo died in Dinwiddie County, Virginia, in 1801. He was presumably traveling to conduct sermons. His burial place is unknown. Volume of Patillo sermons published in 1788.